Pity the poor reviewer, faced with the task of appraising yet another mechanical keyboard. The problem is, for the most part, these things are boring. 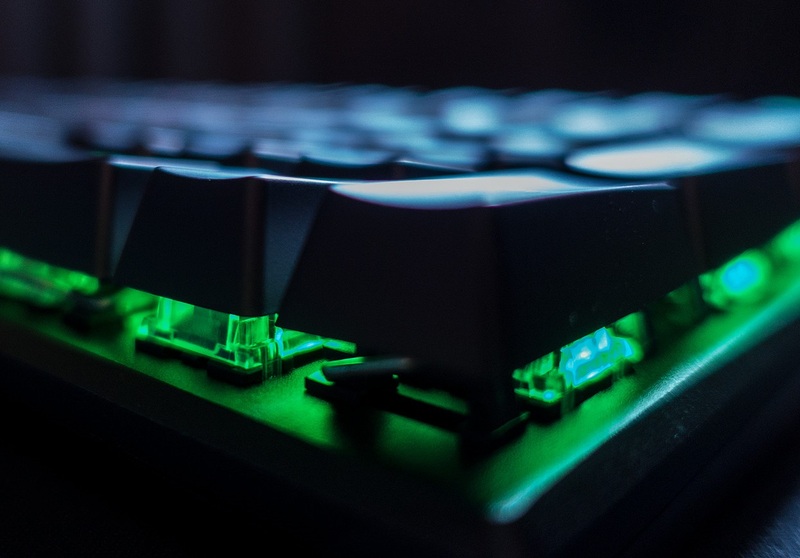 While gaming-oriented membrane keyboards verge on the wild, wacky and innovative, there’s an unwritten rule which says that mechanical devices must do all of the keyboardy things in the least exciting manner possible. Not the Suora FX. This keyboard is about as far from boring as it's possible to be. The Suora FX disrupts expectations without completely throwing out the traditional features you'd expect from a mechanical keyboard. Small form factor? Check. Precise key action? Gotcha. No frills? Er, not quite. It's true that when you take it out of the box the Suora FX looks like an unimpressive black rectangle, but things change as soon as you plug it in. That's because this keyboard has some of the best lighting effects I've seen in a very, very long time. It's the kind of device that has people stopping by your desk just to marvel at the lightshow. The inbuilt lighting routines are just stunning. Obviously, you could go for a practical single-colour setup, but why would you? Some of the many inbuilt patterns include a relaxing raindrop effect, a disco-style extravaganza and a rather lovely cloud of rainbow colours. 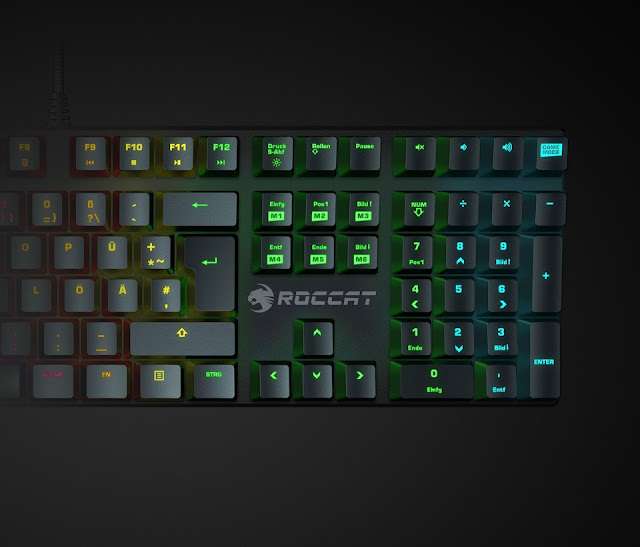 Further tinkering with Roccat's Swarm software unlocks the ability to customise individual keys in pretty much any colour you can imagine. In a clear improvement over Roccat's Horde Aimo keyboard, which we reviewed last year, each key is illuminated evenly and there's precise control over brightness levels. Additionally, the entire keyset is frameless, which means there's no shielding to spoil the view. When you use the Suora FX you can be confident that the whole room will enjoy the spectacle. Another superlative - though not necessarily a good one, depending on your point of view - comes in the form of noise levels. Mechanical keyboards are supposed to be clacky, and this one certainly is. The key action is very light and springy, and keystrokes register positively (and noisily) with the slightest pressure. This makes the Suora FX great for gaming, where responsiveness and feedback - both tactile and auditory - are crucial. Whether you'll find this a good thing when typing is another matter. The keys are precise enough that I didn't make many mistakes while writing this review, but my ears certainly needed a break by the end. Like the lighting, the key action of the Suora FX makes a very clear statement and, if you like things loud, this certainly fits the bill. No review of a Roccat product would be complete without mentioning the driver software, which usually tends towards absurd levels of customisability. In the Suora's case, the small form factor very much dictates what’s possible. While there’s no room for dedicated macro keys, Roccat have done a decent job of squeezing gaming and multimedia functionality onto the standard keyset through programmable secondary functions. An array of pre-programmed (and customisable) game profiles are available, although I found the software more temperamental than usual and had difficulty auto-launching profiles when games started. If you're a power user of Roccat's other products - and particularly if you make use of the Easy-Shift function, which is absent from this device - then you may find the Suora's programmability restrictive. However, the functionality on offer is more than enough for the average gamer and vastly more than you'll find on many other mechanical keyboards. One slight word of caution is that the frameless design makes it all too easy to pop a key off during transportation. The keys push easily back on, but travelling users will need to take extra care when moving the keyboard from place to place. Other than that, there's not much else to say. Build quality and technical specs are all up-to-scratch, with an all-metal keyboard frame and switches that are rated for 50 million keypresses. The keyboard also features n-key rollover, so you can be confident that you can press as many keys as you like all at the same time and they'll all get registered exactly as they should be. So, Roccat's Suora FX is a rare thing: a mechanical keyboard that isn't boring. It's not quite as fully-featured as some over-the-top gaming keyboards, but it’s pretty darned good all the same. That lighting, though... the lighting alone swings the deal. If you're in the market for a mechanical keyboard which makes a statement then you should definitely check this one out.